We began with high spirits in one state, crossed two more, and cheered as our home state welcomed us back. The familiar smells – the stink and the sweet – greeted me as we danced to old music in the front seats and rested our eyes in the back. The enormous river guides us home to our lovely green valley. I appreciate both the water and the green even more. Even as we gained our hour back crossing time zones, we rolled into the driveway in the wee hours of the next day. We lay our sleepy children in their beds for the first time in – we say too long, they say too short – days on days. My body finds its way to sleep as a cat-shaped locomotive purrs at my feet. 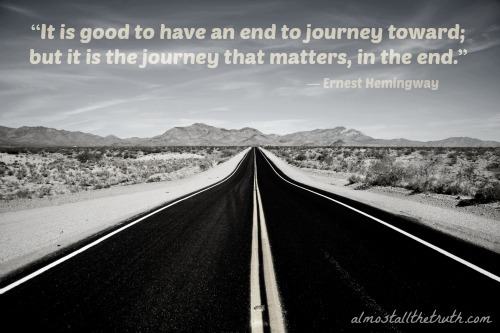 We are truly home and what a journey it has been. I now look toward a path toward healing what has been too long broken – me. 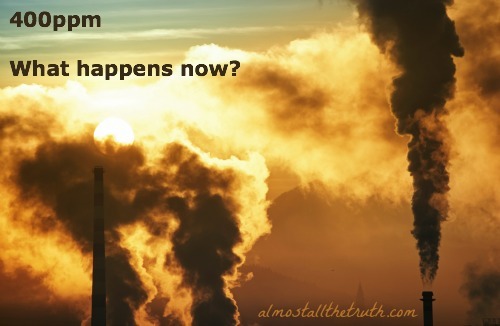 400 ppm, What Happens Now? We just reached what is likely the most important milestone in our climate‘s history, at least as observed through the lens of humankind. What does that convoluted sentence mean? We’ve reached 400ppm concentrations of carbon dioxide. The highest in millions of years. I’ll let that sink in a moment. 400ppm. This is the number experts have long thought was the point of no return. This is the number that still may be, although some are considering 450ppm to be the new “worst case scenario.” I am not sure raising the bar in this instance is a good thing when we have a lot more data supporting a number which sparked a fantastic organization that stands for environmental activism: 350.org. So I am thinking we have a few choices here. Give up. Throw our hands into the air, declare the war won, and wait for the inevitable. Hole up and listen to Free Bird on repeat. Recognize that while the earth may remain, our actions will make sure that our species, along with so many more, will not – stand up and do something! And I think that includes listening to some of the amazing voices of our time. I was inspired by listening to the Dalai Lama and David Suzuki when they joined our governor and the executive director of Oregon Environmental Council at Portland’s Environmental Summit to discuss what our future can and should look like as our actions change the world for the worse and the better. There are great people who believe we have not passed the point of no return. So what is one small step we can take today to alleviate some of the pressure on our environment? I would love for us all to name one. Do you remember those old bumper stickers, “Kill your television!”? It was certainly a violent way to get people to pay attention to their tv watching habits. Television programming has changed since then. Some might argue there are even better programs on – particularly public television, documentaries, science – and some would venture we are continually seeing a dumbing down of the masses. Perhaps there’s both. We also aren’t simply dealing with televisions anymore, but iPads, iPhones, laptops, Netflix, Wiis, and all sorts of electronic screens our children – and us, don’t even try to kid yourself – spend a lot of time in front of. From all the statistics, this one shocks me the most: the average preschooler spends 32 hours of week behind a screen. That number rises for older children. 29% of babies under the age of 1 watch TV and videos for an average of about 90 minutes. 23% have a television in their bedroom. 64% of babies and toddlers (between 1-2) watch TV and videos for an average of slightly over 2 hours. 36% have a television in their bedroom. Time with screens is an important risk factor for childhood obesity in both low-risk and high- risk populations. Screen time for children under 3 is linked to irregular sleep patterns and is linked to sleep disturbance in 6- to 12-year-olds. Children who spend less time watching television in early years tend to do better in school, have a healthier diet, be more physically active, and be better able to engage in schoolwork in later elementary school. There is no credible evidence that any type of screen time is beneficial to babies and toddlers and some evidence that it may be harmful, yet 56% of parents of young children believe that baby videos are good for child development. This is why I believe in participating in Screen-Free Week (which starts today). Can you imagine what these kids could be doing instead? They will too. Once they get over the initial moaning and groaning, they find plenty to do to entertain themselves and since I plan to not use my computer when they have free time, we can do a lot together. 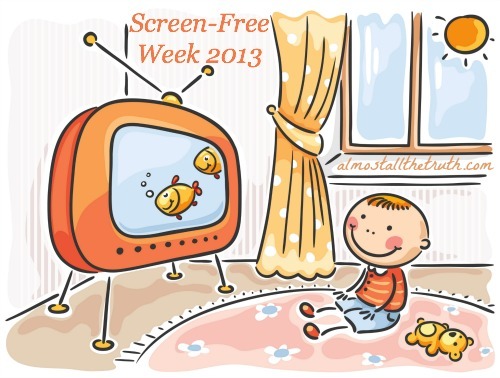 Will you participate in Screen-Free Week this year? Note: Research compiled by the Campaign for a Commercial-Free Childhood. Spring is here in all its glory, showing us pops of color after a winter of gray, gray, and more gray. It’s time to throw open the windows, enjoy the fresh air, and make a few green changes around the house in time for the season. Best of all you can easily make some great green changes for free (or next to it!). The following are a few simple (remember those baby steps!) ideas to try for the season. I am stealing these from some previous posts, so do click through on the pictures for more! 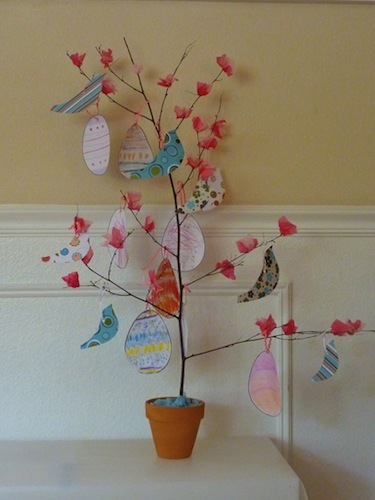 Use your crafty skills, or your kids’, and create something happy, fun, colorful to bring spring into any room using found items. Bringing in nature with a mixture of paper and handcrafted bits make it simple and is bound to lift the mood even when spring showers are working to grow our flowers! Depending on your area’s weather and type of garden, you may have already started, but if not it is still a great time to get your kids – even the littlest – involved in planning one. Talk about perfect for the Spring season! Flowers are the first signs of color, new life, and new beginnings. 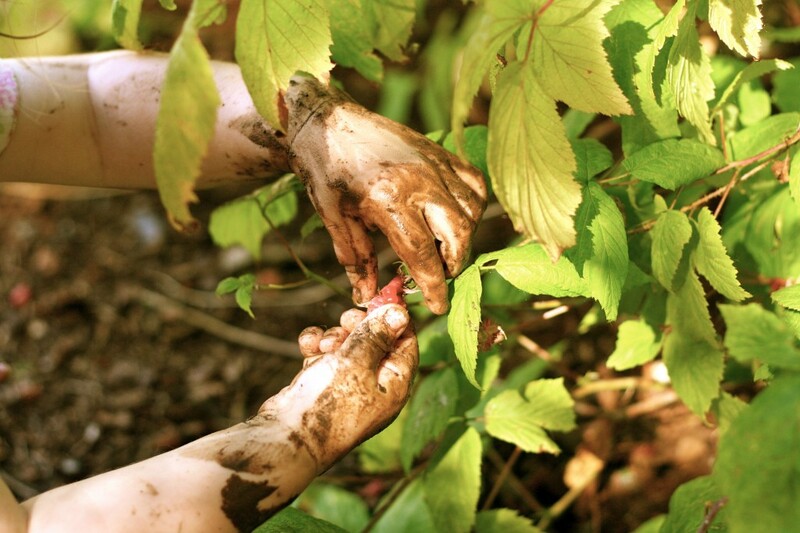 Plant, plan, and most of all get dirty together in the rich soil of our earth. 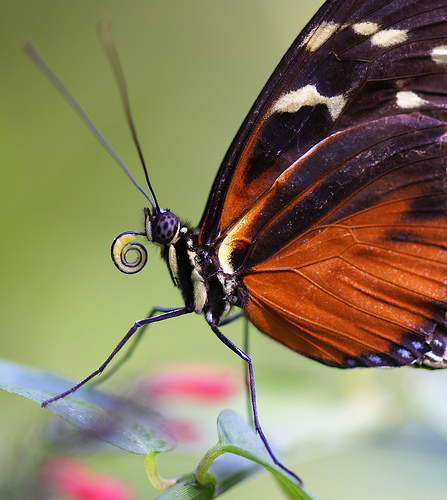 Have you caught your first glimpse of a migrating butterfly yet? Butterflies are such enchanting creatures and many a child has dreamed of cocoons, growing wings and learning to fly. Their rich colors amongst the deep green leaves or lovely pinks and yellows of Spring flowers turn this insect into magic. There are numerous stories that feature them and my favorite butterfly craft is sure to be a crowd-pleaser for the little ones. 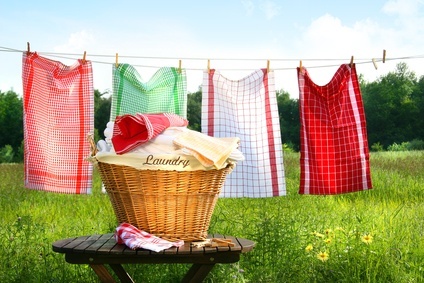 There are a variety of ways to make your laundry room a non-toxic environment, but only one leaves your clothes with the scent only the sun can leave. The weather is starting to turn. We had many days over Spring Break that were sunny and almost 70 degrees! That is time to start line-drying the laundry. One of the easiest changes to save energy and wear and tear on your clothes from the dryer. Plus, who can resist the warmth of the sun on a fresh load of laundry? If you have to do it anyway, go for the best! Wish you could own a house as green as this? 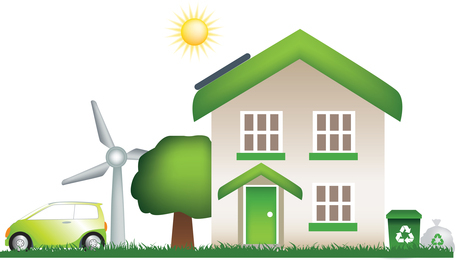 While that may be a dream, there is one simple step to take this Spring to make your home less toxic and more eco-friendly without costing a dime: have everyone remove their shoes as soon as they enter the house. Amazing, but true. 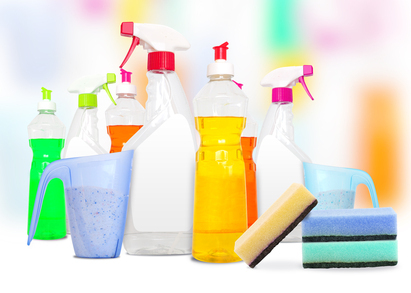 This small change can make a big impact on the toxins inside your home. Make it easy, make it a rule, just do it! Make all my own cleaners? Yes it can be done, but even one simple change can make a difference! Homemade cleaners have become the grail of green gurus. It really is amazing what a little baking soda and vinegar can accomplish, but it does take a little getting used to. One little thing may make a huge difference, especially as we start to see some sun streaking through those windows (just don’t worry about those just yet, they can wait): dusting gently with a damp cleaning cloth. An enormous amount of serious yuckiness from toxins to pesticides resides in the dust sitting on every inch possible. It is important not to sweep it back into the air again and no harsh cleaners are needed, just a little water and reusable rag. Tonight, the Green Sisterhood will be hosting this week’s #ecowed twitter party which will be all about Spring: decor, cleaning, etc. for the green and frugal. Join in at 7pm PST/10pm EST. Follow along with the #ecowed hashtag or check out the discussion through that hashtag in the morning! Hope to see you there!